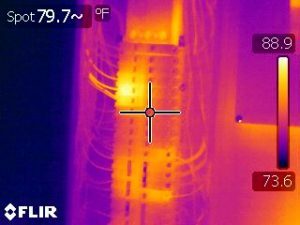 Our infrared scans can help you quickly identify problems with your equipment or building. These scans can be used to make maintenance plans, keeping your building and machinery in it’s best shape. Available for Industrial Electrical Inspections in Louisville and the Northern Kentucky region. Any commercial or industrial facility can benefit by contracting infrared inspections. By utilizing up to date infrared cameras, our thermography imaging services can detect insulation or draft problems that increase utility costs and create an uncomfortable work place.